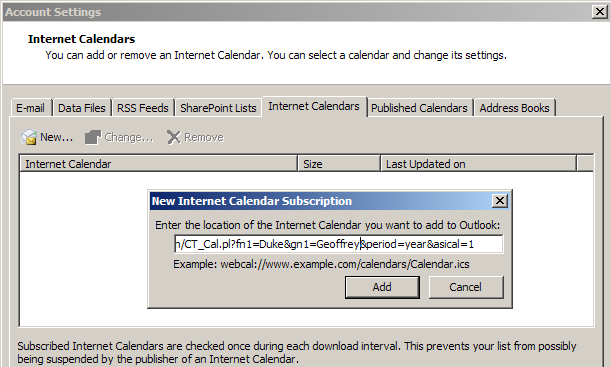 To add Oracle calendar to Outlook 2007, open the Account Settings dialog and click the Internet Calendars tab. Click the New… button, and type in the script URL above, providing your own given and surnames. 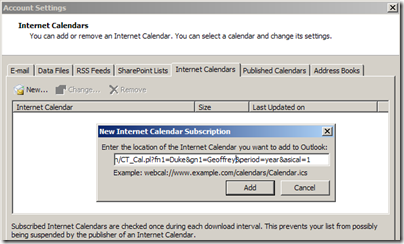 This entry was posted in Posts and tagged calendar, ical, outlook, waw on October 20, 2008 by Geoff Duke. I’ve been using the Synthesis SyncML client to synchronize my calendar information between my Oracle Calendar Server (OCS) agenda and my Treo700w calendar. It is important to note that, per the vendor’s recommendations, I’m using the back-level 2.5.0.69 client, rather than the newer 3.0x client. Update: The UVM Calendar server has been upgraded, and the current version (3.0.222 at the time of this edit) of SyncML works fine. I downloaded the Zip file from Synthesis AG, which contains the program install file (syncml_std_en.PPCWM.CAB) as well as documentation. Because I’m using the Treo with Windows Vista, I don’t have ActiveSync. To install the software, I copied the CAB to my Treo, then used File Explorer to locate and install the SyncML application. This entry was posted in Guides, Popular and tagged calendar, SyncML, WindowsMobile on March 8, 2007 by Geoff Duke.